Mr. Gangji Nagda who lives in Koperkhairne, is a 70 years old gentleman. 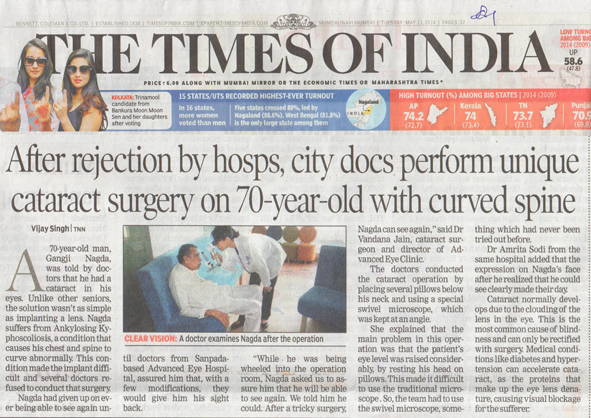 He threw a very unique challenge to the best of the eye doctors and cataract surgeons in Mumbai and Navi Mumbai. Mr. Gangji Nagda is suffering from Ankylosing Kypho-scoliosis, a condition which causes his chest and neck spine to be curved forward abnormally. In Mr. Gangji’s case, it was so severe, that his upper spine is permanently slumped forward like a C.
When age caught up with Mr. Gangji’s eyes and his eyesight deteriorated due to cataract, he went to see many reputed eye surgeons in Mumbai and Navi Mumbai. However, right from Vashi to Nerul to Panvel, cataract surgeons were flummoxed as to how they would operate on Mr. Gangji, a person whose head could not touch the operating table and face is at 60 degrees angle even after possible positioning? During a cataract surgery the patient has to lie flat on the table with head touching the table so that the microscope can then be focussed over the patient’s eyes for surgery. Disappointed and exasperated, his son-in-law brought him to the Cataract Surgery Centre at Advanced Eye Hospital and Institute in Sanpada, Navi Mumbai. All the pre-surgery tests and check-ups were done, and the surgery was scheduled. Having been rejected so many times earlier, Mr. Gangji Nagda could not believe that he was finally going to be able to see clearly. “Sister, will I really be able to get rid of my cataract?” he kept asking the OT nurse even as he was wheeled into surgery. A combination of advanced technology and sheer determination of the surgeon, Dr. Vandana Jain and operating staff helped achieve the impossible and the cataract surgery was finished successfully. With the modern advancements the patient bed was tilted, operating microscope was tilted, and the seating position of the cataract surgeon was elevated. All these manoeuvres allowed the cataract surgeon to perform the cataract surgery in a patient who could not lie down flat. When he was wheeled out of the surgery without any complications, the joy on Mr. Gangji Nagda’s face had to be seen to be believed and this was our reward for doing a challenging cataract surgery effectively. Dr Vandana Jain is a renowned Cornea, Lasik and Cataract surgeon and the Director of AEHI. Dr Jain has won best fellow awards and medals at Delhi University and L.V.Prasad Eye Institute and then further trained at Harvard, USA. Having performed more than 10,000 cataract operations, she has vast experience of dealing with all kinds of complicated cataract surgeries. According to her cataract surgery needs to be customised to the patient’s needs and physical disability. She additionally believes that team work and alliance with other specialists help in planning and giving the best cataract surgery results to the patients. Cataract Surgery Centre at Advanced Eye Hospital and Institute in Navi Mumbai is one of the best cataract eye surgery hospitals in India. Diagnostic suits for pre-surgery measurements and check-up and the operation theaters are state-of-art and equipped with the best cataract surgery machines. Personalized care, infection free modular operation theaters and beautiful ambiance complement the cutting edge eye care offered at AEHI. Besides treating patients from Kharghar, Nerul, Vashi and Panvel, patients from all over western India travel to AEHI for world class cataract treatment. If anyone of your family or you yourself needs evaluation for cataract, pls call us at 02267313636, we are open from Monday- Saturday 9:30am-7pm.